I print out all my recipes ahead of time and make a shopping list (you can find this below). I chopped all the vegetables and I then label each bag with directions, cook times, additional ingredients, etc. You do not need to pre-cook anything for this week’s menu. All ingredients can go directly in the bag and then to the freezer. Thaw, throw in the crockpot and your done! All meals will cook fine from frozen, but be sure not to add cold/frozen meals into a hot crockpot as it can crack. Many people have concerns about putting frozen food in the crockpot, but I have never had an issue. It is my understanding that once the food reaches a certain temperature, it is fully cooked and safe. If you have concerns, just thaw in the fridge the night before. Cook times will vary depending on your crockpot. It may take you a few tries before you get used to how long things take. In general 6-8 hours on low will do the trick. If all ingredients are pre-cooked, 3-4 hours will work. There are a lot of different crockpots out there. Mine is from the middle ages, has no temperature gauge, only low and high. I have burnt things many times:) It’s a learning process, but you will perfect it with practice. Now get crockin! 1. Combine all ingredients in freezer bag and freeze. 2. Place ingredients in slow cooker, cover and cook on low for 6-8 hours. 1. Combine roast, wine, hot sauce, garlic, salt & pepper in freezer bag and freeze. 2. Place ingredients in slow cooker, cover and cook on low for 6-8 hours. Beef should shred easily. Leave in juice. 1. In a bowl, mix the ground beef, bread crumbs, parsley, garlic, onion, and egg. Shape the mixture into 16 meatballs. Lay flat in freezer bag and freeze. 2. In a slow cooker, mix the spaghetti sauce, crushed tomatoes, and tomato puree. Place the meatballs into the sauce mixture. Cook on Low for 6 to 8 hours. Serve over hot pasta. 1. Combine the chicken, potatoes, carrots, celery, chicken soup, chicken bouillon, garlic salt, celery salt, and black pepper in freezer bag and freeze; cook on High for 5 hours. These recipes look delicious. My co-worker just introduced me to you crockpot freezer meals. In case you’re interested, I put the recipes into an easy-to-follow table. They fit onto 2 pages plus one extra for the ingredients. I also divided up the ingredients into their section of the store to make shopping easier. If you are interested, email me and I will send it to you. Just came across your slow cooker freezer cooking series and am excited to try out some of your recipes! Question for you about the chicken tenderloins/chicken breast…when you buy frozen, do you defrost first then refreeze after mixing with the other ingredients? 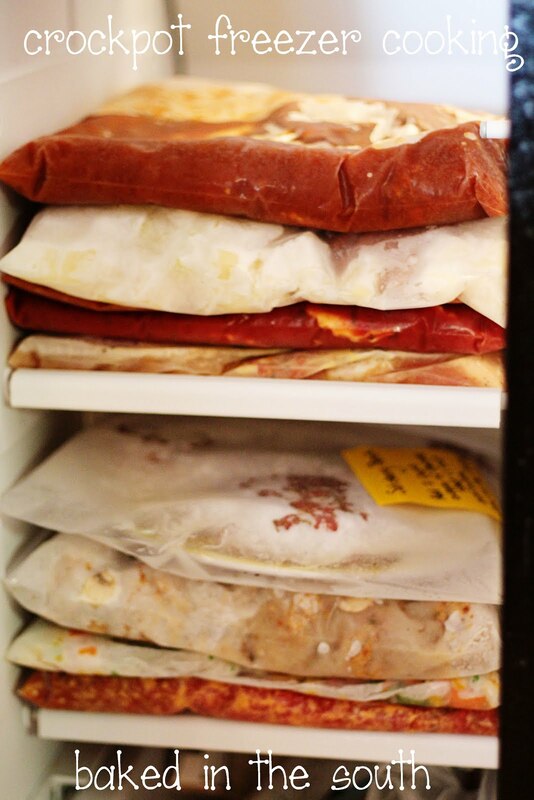 Or do you just add the frozen chicken directly to the freezer bags with the other ingredients, without thawing first? Thanks!